In the summer of 2018 I travelled to Novosibirsk, Russia, to do field work in southern Siberia with Galina Azarkina of the Institute of Systematics and Ecology of Animals. We travelled to the Kazakhstan border, the beautiful Altai, and the magical Tuva — I in search of Pellenes, Galina in search of aelurillines. I blogged the expedition in my personal blog, and have compiled all the posts here. In mid 2017 we undertook a spectacularly-successful expedition to the hills and mountains of Oaxaca and Chiapas in Mexico (and a bit also to the state of Queretaro). I blogged live from the field to my personal blog, and have compiled all the posts into a report on the expedition. Enjoy! Today is MacClade’s 30th birthday! Version 1 was released 21 June 1986, with David joining me for version 2 the following year. The last release was version 4, but it’s not commonly in use today, as it is no longer compatible with modern operating systems. Those biologists who use it need to maintain ancient machines (or emulators) to run it. There are, however, some who do use it, and we often get comments that people miss it. Some of its DNA persists in Mesquite (both conceptually and as some code translated straight from Pascal into Java). Happy Birthday, MacClade! Over the years, I’ve tried to take photographs of living males and females of every species of jumping spider collected on most of our expeditions. This amounts to many hundreds of species, some of them poorly known or entirely undescribed. In total, I have about 27000 digital or digitized photographs of salticids, some going back to the 1970’s. There has been no point in keeping them secret, but any system of organizing them for release was hampered by the lack of a good taxonomic organization of the family. Now that I have published a new salticid classification, that problem is solved. Thus, I am releasing most of my photos here: http://salticidae.org/salticidImages. They are released under a Creative Commons license so that they may be re-used. My hope is that they will be useful to other arachnologists in their research, and that arachnological elves will incorporate them into Wikispecies and other places. As noted, this collection includes many images of undescribed species. If you plan to describe some of these species, please contact me first, because I may already be preparing a species description. Consider this as a fair exchange, because if I am not describing the species, then you are welcome to use the photographs in your own publication describing the species. 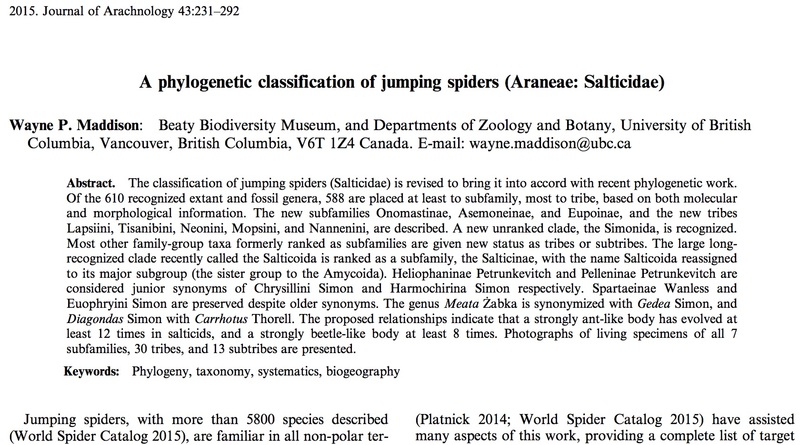 Yesterday, my paper on the classification of jumping spiders was released online; the paper publication is 25 November. It’s good old-fashioned taxonomy/systematics, finished with hand-carved wood, and leather, and brass, but on the inside is phylogenetics, the union of my 44 years of looking at spider bodies and our 20 years of molecular phylogenetic work. It is the first new complete classification of the family published since 1903, and implicitly the first phylogenetic treatment of all 600-plus genera. The paper is available online here. I expect that, among all the works in my career in empirical, theoretical and computational systematics, this paper will give me the most pride, and will best give the spiders the honour they deserve. In the cloud forests of Ecuador we found, in 2004 and 2010, some small shiny black jumping spiders that we couldn’t recognize. Gustavo Ruiz and I have just published a paper describing them as the new amycoid genus Urupuyu, from the Quechua words for spider (uru) and cloud (puyu). This paper does a lot more than that, however. We take the opportunity to do a phylogenetic analysis of the whole clade of amycoids, and present, finally, a comprehensive phylogenetic classification of the group. I’m proud of what Gustavo and I accomplished with this paper, as it is a major step forward for salticids in the Americas. Ruiz GRS, Maddison WP. 2015. The new Andean jumping spider genus Urupuyu and its placement within a revised classification of the Amycoida (Araneae: Salticidae). Zootaxa 4040: 251–279. I think of Linnaeus as the founder of bioinformatics, as he established 250 years ago an implicit database (publications about our classification) with a defined ontology (taxa, taxon ranks, hierarchy) and rules for application. The rules help mediate disputes and maintain order. Among the modern rules are that names are attached to specially designated specimens, and if there is doubt, you go back to the “type” specimen to understand how to apply the name. Thus, Abel Bustamante, Gustavo Ruiz and I found that the type specimens of the type species of the familiar American genus Thiodina didn’t look like what we had expected. 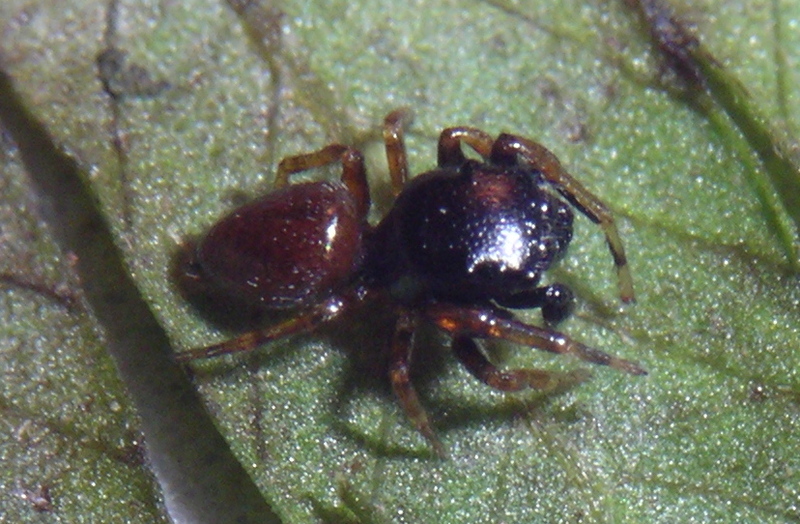 This meant that the name Thiodina applies to a rather different group of spiders than we had thought, and we have to start calling our familiar species by a different name — Colonus. Annoying, but not disastrous, and it makes sense to respect the rules as long as it doesn’t hurt too much. Our publication about this just came out. David’s been visiting here for a few days, and we’ve used the chance to work on Mesquite, which has led to our releasing version 3.04. This version gives us a lot of satisfaction: more stable, and with some nice new features. Nothing earth-shaking, but sometimes the best new features are little ones that simplify life. Check out the page with new features. PechaKucha: Can spiders inspire art and design? Last week I gave a talk at PechaKucha Night Vancouver, which is a public mini-symposium of fast-paced talks fueled by beer and a warm-up band. The audience and speakers are full of energy and idealism. Most are connected with the art and design community, but unexpectedly our night was mostly political/social. Great (and moving) talks. Why was I, a biologist, talking in a forum for art, design and social projects? Well, watch to find out. Wayne Maddison's lab at the University of British Columbia focuses on jumping spider systematics and evolution, and on computational and theoretical phylogenetics. That is to say, we discover how cool jumping spiders are, and how amazing is the history of diverging genetic descent.